The financial power of attorney is a powerful legal document you can use to entitle an agent to perform a range of monetary related transactions on your behalf. You can choose any number of these subjects, or you can allow the agent to act for you regarding only one. It is important to tailor the document to your needs to minimize the risk of your agent doing anything beyond your wishes. Pennsylvania revised its law to require a lengthy notice at the beginning of all power of attorney forms. 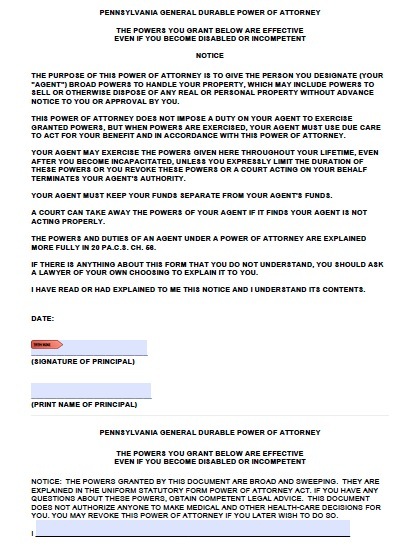 This notice reiterates to the principle that the form grants a great deal of power to the agent, and informs the agent that he or she assumes legal duties by acting under the document.